We are going international – to the West Indies for a look at some pepper sauces that you can get here in the US from California-Antilles Trading online. We can’t tell you how excited we are to be able to share with you these wonderful sauces from abroad, and the fact that they are so easily obtained. We’ve not been a fan of cayenne pepper sauces in the past. Sauces like Crystal, Texas Pete, and Trappey’s all taste the same of salt, vinegar and a thin, sharp biting heat that just seems so watered down. But we have recently discovered more gourmet style richer tasting sauces like Swamp Scum, Louisana Gold, and recently Mama Bull’s that are changing our minds. Here are two sauces that are so rich tasting that they will be on our table alongside the venerable Tabasco, Pickapeppa, and Cholula sauces. That’s saying something folks! Both of these “pepper sauces” start with a few simple basic ingredients – peppers and vinegar. Yup. It’s the West Indies equivalent of our Louisiana style sauces here in the U.S. Ingredients: Cayenne Pepper, vinegar, salt, and select herbs and spices. Brian: I love the tall, skinny bottle. (It’s similar to the bottle that you find “Louisiana Brand” hot sauce in. The one with the “one drop does it” logo.) At only 3 ounces, I’m still impressed by the packaging. Marilyn: The dropper hole is very small, but the sauce is thicker than I thought it would be. Brian: Thin, hard to get out of the bottle with the tiny hole in the top. You have to really shake it hard to get the sauce out. There are dark bits floating in the sauce that tells me there are herbs and spices in this goodness. Marilyn: Nice burnt orange color, smooth and slightly thick. Nice cling factor and I love the consistency. Brian: It has a thick, rich taste that I don’t get from U.S. produced products. With a nice peppery flavor, the freshness of the cayenne shines through. The herbs and spices are present and round out this sauce to bring it up a level or two above the domestic versions. Marilyn: Cayenne pepper, vinegar, garlic, salt, hot. Very well balanced and fresh tasting. Brian: – Tingly, tangy, edge of your tongue heat – this sauce brings it, without being overpowering. Newbies would think this is some hot stuff! Brian: Simple, elegant packaging and label. A crude graphic of a cayenne pepper alongside a “pepper picker” is all that adorns the black label… with simple text. “All Natural” and “Full Flavored” are the only other clues to the quality of this sauce. Marilyn: Very classic almost old school label. I also like the skinny bottle. Pretty bottle to have on your table. 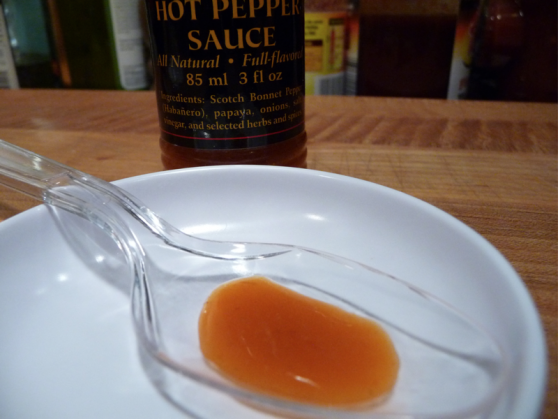 Brian: – I have to rate this my highest for a cayenne based sauce. Great flavor, body, color… simply the best “Classic Red Sauce” I’ve ever had. Marilyn: – I love the consistency and flavor – you could use this every day. Brian and I agreed this sauce would be great in a Bloody Mary. Ingredients: Scotch Bonnet Pepper (Habanero), papaya, onions, salt, vinegar, and selected herbs and spices. Brian: Another winner with the skinny 3 ounce bottle. The simple graphics on the label show a habanero or “scotch bonnet” pepper. Marilyn: Color is more beige than orange. Smells of a big hit of vinegar. Brian: Another thin sauce that has to be shaken from the bottle, but the rewards are intense. Again you will see bits from the herbs and spices, and will be rewarded with a tasty sauce. Marilyn: Not as thick as the other, looks more powdery or more complicated looking sauce. 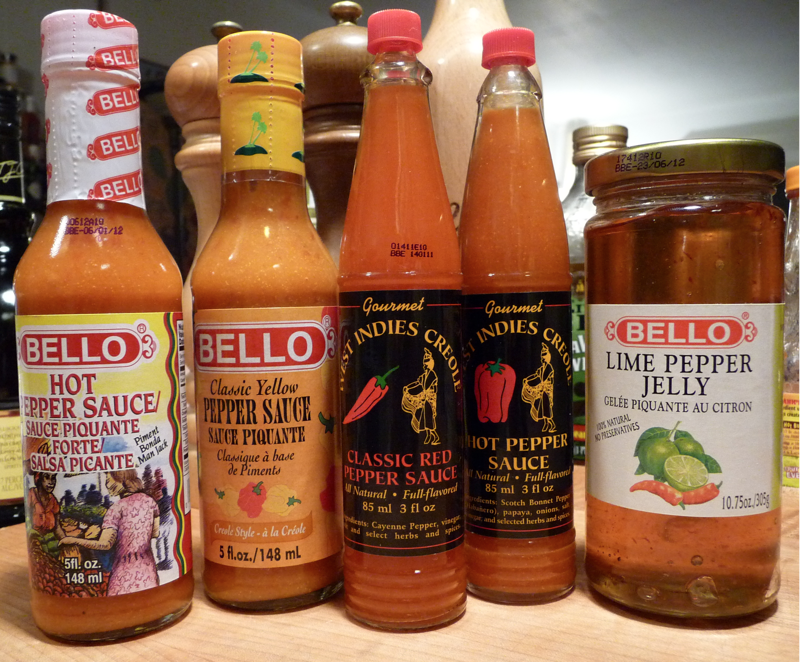 Brian: Lot’s of heat – more so than the previous sauce. Again the burn will not hurt you, but you will taste and feel it. Even with the habaneros, it’s still only a medium burn. Not a bad thing though – it’s a pleasant level of heat. I enjoyed this sauce as much as the first one. Marilyn: Vinegar first. Garlic and salt. It’s too hot for me. Pretty smooth though. Brian: – Wow! Hot – heat – delicious. 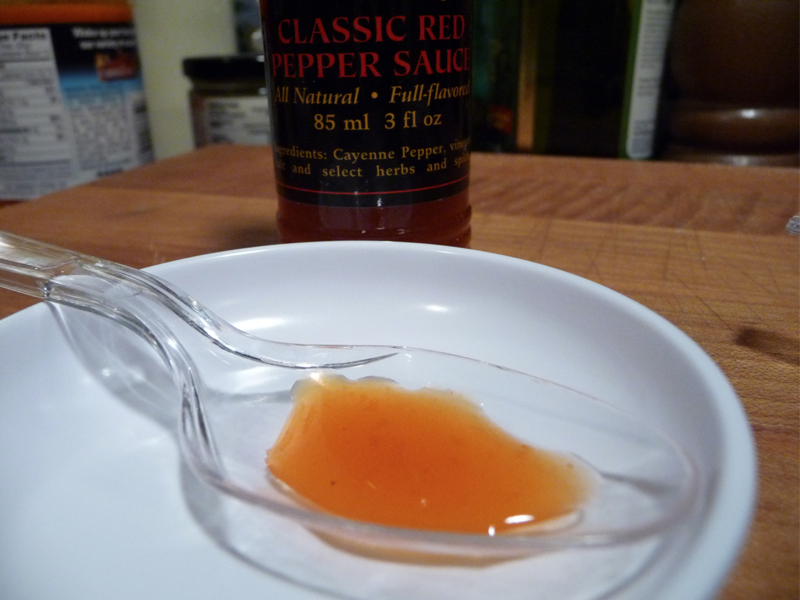 The heat level is not so hot that you are hurting, but for a cayenne habanero sauce, this is yet another winner! Marilyn: – It’s a stingy tip of my tongue heat. My lips are stinging. Brian: The Scotch Bonnet pepper on the label tells you that you are in for something special. Again, simple graphics, complex sauce inside! Marilyn: Very similar label. Still a classic looking bottle. Brian: – I much prefer the Classic Red. It rocks… and this baby’s hot. Marilyn: – Great quality sauce, but it’s really too hot for me. I too prefer the Classic Red. What would you put this sauce on? Eggs, tacos, pizza, nachos, chili … anything and everything. These are great all around pepper sauces! I love that you guys mention Cholula in this review. If these offerings strike that kind of chord they deserve a shot in my sauce rotation! Great review as always guys! Yeah they’re both winners but I’m gonna stick with the classic red for the flavor profile it offers. Great review. I personally like everything very hot, but this time I think I’d choose the classic one, cause I don’t like the smell and possible taste of vinegar of the hot sauce. Thanks for posting. It’s so great to know you’re reading our blog! We appreciate the comments! I think I would go with the Red too but would use the hotter one tamed down as an ingredient in a recipe perhaps. Great point Chris! You just gave me an idea… the habby would be great in Chili. 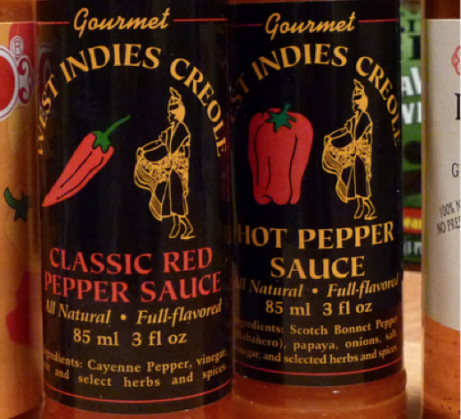 I love the West Indies Creole Hot Pepper Sauce. At first I thought it was too hot, but it grew on me and we slammed through our ten ounce bottle. I just ordered two online. Really looking forward to its presence in our pantry again! It really is a tasty sauce, Claire. And I love the small bottle. It fits in well with our “collection” of other bottles. Order from http://calantilles.com/ and tell them HotSauceDaily sent you! I have been ordering the West Indies Creole sauce for many years from Richard’s Antillies Trading Co. I noticed that the last batch I ordered had a smaller diameter shaker top. I guess too many newbies were getting burnt. I personally take the plastic shaker lid off. It’s my all time favorite hot sauce. Second place is Buffalo brand, Chipotle Sauce. 79 cents a bottle at Wall Mart. Can’t beat that. Thanks Doug! Another fan of the WI Creole! Hey, there’s nothing wrong with the Búfalo sauces either! They can be really hot.